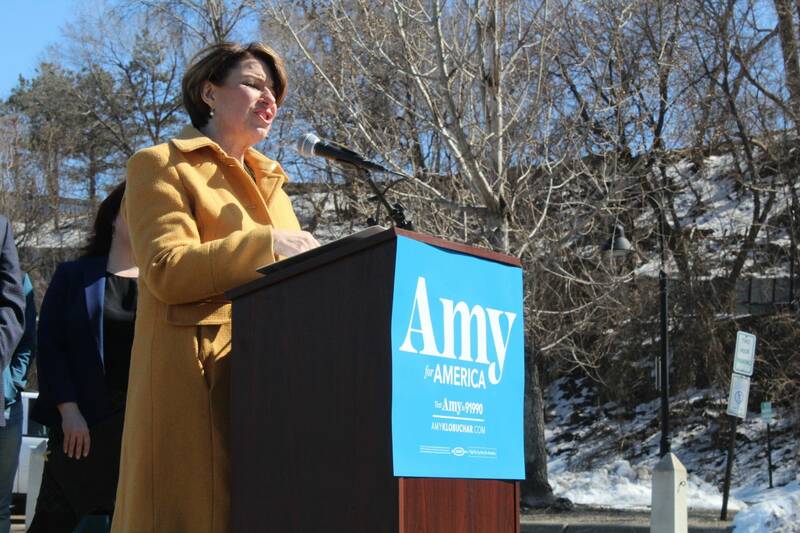 With the Interstate 35W bridge as her backdrop, Sen. Amy Klobuchar made a hometown presidential campaign stop Sunday and used the 2007 bridge collapse to underscore her call for a $1 trillion infrastructure plan. "We know all too well the dangers of failing infrastructure," Klobuchar said, adding that her plan proposes to repair the nation's highways, roads and bridges first. About $400 billion of the Minnesota Democrat's plan would come from increasing the corporate tax rate to 25 percent. The current rate is 21 percent, slashed from 35 percent under the Trump tax law, which took effect last year. Klobuchar took aim Sunday at both the tax bill and President Trump, who is slated to visit Minnesota on Monday — Tax Day — to promote the law. She also said the president hasn't lived up to his promise to pass an infrastructure bill. "When President Trump took office, he promised to pass an infrastructure package to rebuild our country. That was one of the things he campaigned on and it's one of the things that he said the night that he got elected. This plan turned out to be a mirage," Klobuchar said. In addition to road and bridge repair, Klobuchar said her plan calls for repairing schools, flood and climate change mitigation, and rural broadband, among other things. Much of Klobuchar's speech Sunday focused on the I-35W bridge collapse, which killed 13 people and hurt 145 others on Aug. 1, 2007. She and others in the Minnesota delegation worked quickly to pass a bill through Congress that kickstarted funding to rebuild the bridge. "A bridge just shouldn't fall down in the middle of America," Klobuchar said, quoting herself from after the bridge fell. "Not a bridge that I travel over every day with my family. Not an eight-lane highway. Not the busiest bridge in our state." Another Midwestern Democrat entered the 2020 presidential contest Sunday. Mayor Pete Buttigieg of South Bend, Ind., officially declared his candidacy. Asked by a reporter if another contender from the Midwest hurts her chances of winning, Klobuchar said she welcomed Buttigieg to the race. "I think it's good we don't just have one candidate from the Heartland; that seemed kind of lonely," Klobuchar said. Klobuchar faces an ever-more-crowded Democratic field in the presidential contest. Her campaign has raised more than $5.2 million — about as much as that of New Jersey Sen. Cory Booker. The two lag behind other frontrunners including California Sen. Kamala Harris, former U.S. Rep. Beto O'Rourke and Buttigieg. Vermont Sen. Bernie Sanders' $18.2 million leads the Democratic field. Then there's Trump, who has vowed to win Minnesota after narrowly losing the state in the 2016 election.